Western dance force – 1 to 2 classes per week. Exeter Gymnastics club – 2 classes a week as she is in the competition squad and competes at various times throughout the year. Ballet boost – monthly, which is an international vocational training course for aspiring dancers. South West theatre ballet – where she has just performed as foot stool in their professional production of Beauty and the beast. Creative theatre workshop – in school holidays. 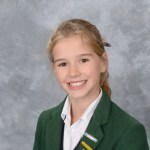 Within St Peter’s Preparatory School, Kitty is currently studying for Grade 5 singing (ABRSM). In addition, she is a member of St Peter’s Players who are working on their latest production of Dazzle. Kitty is also a member of the Senior choir.